SPECIAL. Snowdance (Bernard Fayd’Herbe) waltzes away with the R1-million World Sports Betting Fillies Guineas (Grade 1) over 1600m at Kenilworth on Saturday. Her trainer Justin Snaith said, “She’s been special since Day 1.” PHOTO: Liesl King. Fayd’Herbe rides four winners for the stable. Snowdance confirmed her champion status by pulverizing the opposition once again in the Grade 1 WSB Fillies Guineas at Kenilworth on Saturday. 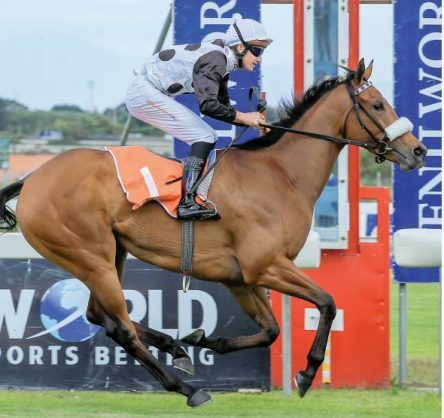 The doubters said the daughter of Captain Al was flattered by an even easier Western Cape Fillies Championship a month ago, but under a supremely confident Bernard Fayd’Herbe ride she cruised clear with just under 400m to go and her jockey was able to gear right down and still win by 3.25 lengths. Fayd’Herbe said he hadn’t ridden a filly as good as this “since Sun Classique’’, while Justin Snaith said she was “a lovely filly who has been special since day one, and has a perfect temperament. Her next appearance will probably be the Majorca on Met Day’’. The stable once again dominated on a big race day, with five wins, four of which were booted home by Fayd’Herbe. Stablemate Oh Susanna just got up for second with Fresnaye third to complete the Trifecta for Drakenstein Stud, although the winner is co-owned with Jack Mitchell. Remarkably Racing Manager Kevin Sommerville said it wasn’t the first time they had completed this feat as “Inara, Same Jurisdiction and Lanner Falcon were the first three in the Majorca two years ago’’. Horse of the Year Legal Eagle remained undefeated over 1600m, but faced a stern examination from Captain America and Edict Of Nantes over the final 200m of the Grade 2 Green Point Stakes. He came through like the champion he is though, and Sean Tarry said, “This is always the tricky run – there’s no pressure in his sprint after a rest. I thought Anton Marcus gave him a very sympathetic ride.’’ Silicon Valley scored a longoverdue first graded win when running on strongly under replacement rider Donovan Dillon to win the Grade 2 WSB Cape Merchants over 1200m. The seven-year-old has twice had double knee chip operations and was only having his 20th run after making his debut in November 2013. Glen Puller said the lightframed gelding “has a very special place in my heart’’ and went on to joke, “When I heard Delpech wasn’t coming I thought we might win, as Marwing got off when Illuminator won the Million Dollar race.’’ The versatile little fellow is nominated for the Sun Met and may also take his place in the L’Ormarins Queens Plate, “depending how he is tomorrow’’. Earlier Mike de Kock scored his first win since bringing a string to Cape Town for the season when Best Kept Secret scored in a FM 76 sprint.